Robert Frost was born on March 26th, 1874. 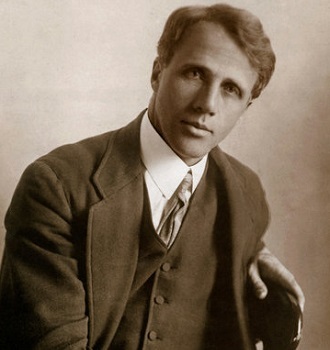 One of the most celebrated poets in America, Robert Frost was an author of searching and often dark meditations on universal themes and a quintessentially modern poet in his adherence to language as it is actually spoken, in the psychological complexity of his portraits, and in the degree to which his work is infused with layers of ambiguity and irony. Robert Frost's work was highly associated to rural life in New England. The poet often uses the New England setting to explore complicated philosophical and social themes. As a well-known and often-quoted poet, Robert Frost was highly honored during his presence on earth, receiving 4 Pulitzer Prizes. Robert Frost father was a former teacher who later turned newspaper man. His father was also known to be a gambler, a hard drinker, and a harsh disciplinarian. For as long as his allowed, he had a passion for politics. Robert Frost resided in California until the age of eleven. Frost moved with his mother and sister to eastern Massachusetts, after the death of his father. Frost mother later joined the Swedenborgian church and had the poet baptized in it. As an adult, Frost left the faith of his mother. As a city boy, Frost grew up understanding so many things in life and had his first poem published in Lawrence, Massachusetts. In 1892, he attended Darthmouth College for just less than a semester. While in Darthmouth College, Frost joined the fraternity called Theta Delta Chi. Frost went back to his home town to work and teach at various jobs including newspaper delivery and factory assignment. Robert Frost sold his first poem titled My Butterfly in 1894 to The Independent at the rate 15 dollars. Frost was proud of the success the poem brought to him and went on to ask Elinor Miriam White's hands in marriage. Both Elinor and Frost had graduated co-valedictorians from their high-school and remained in contact with one another. However, Elinor Miriam White refused the notion to marry Frost, mentioning that her education was important first. Robert Frost felt another man was occupying his position in White's heart and went on an excursion to the Great Dismal Swamp in Virginia. He came back in 1895 and asked Elinor White again to marry him. The same year, both of them became happily married. The couple taught school together until the year 1897. Robert Frost later entered Harvard University for 2 years. His records were good, but he decided to go back home because Elinor is expecting her second child. Frost grandfather bought a farmer in Derry, New Hampshire for the young couple. Frost remained there for a space of 9 years and wrote so many of the poems that will make up his first works. While attempting to pick up poultry farming business, the whole thing went unsuccessful. Frost was forced to settle for another at Pinkerton Academy, a secondary school. Roberts Frost went to Glasgow with his family in 1912 and later lived in Beaconsfield. In the next year, Frost published his first book titled A Boy's Will. In England, Robert Frost made important contacts including T. E. Hulme, Edward Thomas, and Ezra Pound. The mentioned names were the first Americans to write a favorite review on Robert Frost's work. Some of the first pieces of his poet work were written while living in England. In 1915, Robert Lee returned to America and purchased a farm in Franconia, New Hampshire. That same year, Frost launched a career of writing, lecturing and teaching. Frost became an English professor at Amherst College from 1916-1938. While a professor at Amherst College, he advised his writing students to always bring the notion of the human voices to their craft. From 1921 and the next forty-two years of his life, he had three great expectations. During summers, Frost spent time teaching at the Bread Loaf School of English of Middlebury College in Ripton, Vermont. Nevertheless, Middlebury College still owns and managed Frost's farm. Middlebury College as managed his farm as a National Historic Site located near the Bread Loaf campus. He also represented the United States of America on several official missions. At the January 20th, 1961 inauguration of President John F. Kennedy, Frost recited a poem in titled "The Gift Outright." Over the course of his career, he became popular for poems involving interplay of voices such as Death of the Hired Man or dramas. To be factual and upfront here, Frost's work was highly well-known among so many people and it remained so. Among Frost popular shorter poems are "Mending Wall", "Directive", "Stopping by Woods on a Snowy Evening", "The Road Not Taken", "Nothing Gold Can Stay", "Fire and Ice", "After Apple Picking", "Birches." Robert Lee Frost won the Pulitzer Price on 4 different times. This is an achievement unequalled by any other American poet. Robert Frost finally died in Boston on January 29th, 1963. He was happily buried in the Old Bennington Cemetery, Vermont. Harvard's 1965 alumni archive dictates that Frost had an honorary degree in the university. He also received honorary degrees from Oxford, Bates College, and Cambridge universities. History records that Robert Frost was the first person to receive 2 honorary degrees from Dartmouth College. During his lifetime, the main library of Amherst College and as well as the Robert Frost Middle School in Fairfax, Virginia were named after him. Since the nineteenth century, American poetry has developed in two main streams; the first began with the free, pulsating, incantory verse of Walt Whitman, while the second started with the experiment and innovation of Emily Dickinson. Frost owes a little to both traditions, though he has, on the whole, tended to work from and continue an earlier tradition and thus create a tradition of his own. Records have shown that Frost was a farmer, a poet, a rare combination. As a farmer, Frost only spent ten years in the occupation. Frost works have been perfectly divided into 9 collections or books. There are several great poems found in the list such as Mountain Interval, North of Boston and New Hampshire. Frost usually displays the life occurring in New England and showcased it via his poems. With the comprehensive explanation of this article, you are sure to discover Robert Frost life and his achievement on poems. Frost is worth calling a lengend after reading through the great work of his hand.